A venue worthy of a mention in this week’s Benidorm focus is the Tower Lounge, situated at the Old Benidorm end of Calle Gerona on the opposite side of the road to the Hotel Diplomatic. 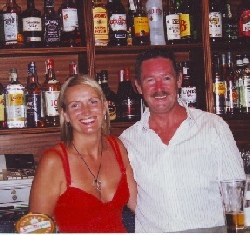 The owners John and Elaine have been here in Benidorm for the past eight years and have certainly found a winning formula in the Tower Lounge as it packed to capacity almost every night. The bar takes it’s name from the Blackpool Tower Lounge and on the walls there are British Seaside saucy postcards which took me back to the time when cards like that were actually very much a part of the annual summer holiday. Cabaret is the name of the game every night with no less than two artistes performing at 21.30 and 22.30 respectively. John who hails from Glasgow has been in the licensee profession for many years so knows the business inside out whilst Elaine who is originally from Salford, Greater Manchester worked as a nurse. Drinks are reasonably priced and there is a good selection of draught beers and lagers including Tetley’s, John Smith’s, Mahou, Carlsberg, Fosters and Strongbow in addition to a large variety of wines and spirits. The atmosphere is indeed very friendly and comfortable with everyone in that holiday mood and enjoying the entertainment on hand. One thing I was very impressed with was that the closing address and thanks around midnight were given by John himself and not left to the final artiste. If you want a good night out with Cabaret in cosy surrounds then go down to the Tower Lounge on Calle Gerona and see John and Elaine I can assure you of a good evening. This venue is highly recommended by espana-resort,com . The venue was visited three times during June 2009 on all occasions the atmosphere, the service and the entertainment was second to none. You really should give the Tower Lounge a visit and experience it for your self, we recommend you go early to choose your seats.